In many projects, I need to create a keystore to store SSL certifications. Majority of times I hardly worry about the validity of a Keystore. My keystores just works and I can see the content of all certifications by using keytool command. It works pretty well until recently when I needed to configure TLS for Cloudera Manager on BDA. BDA has its own command to enable TLS for Cloudera Manager,Hue and Oozie in a pretty easy way. Just run command bdacli enable https_cm_hue_oozie. The only drawback for this command is that it is using self-signed certificate, not the users’ own certificates. Although it works good from security perspective, it’s not a good idea in the long run. I need to replace Oracle’s self-signed certificates with client’s certificates on BDA. Either Cloudera’s approach or Oracle’s approach is not going to work. Anyway, it is a different topic and I will discuss it in a different blog. During my work to enable TLS with Cloudera Manager using client’s certificates, I run into various issues. After looking at many issues in detail, I suspect the key issue of my problem might come from the incorrectness of my keystore. Unfortunately to configure TLS with Cloudera Manager, agent and services, it requires to shut down CDH cluster and many steps to reach the stage I can test the keystore. It’s too time consuming for a busy BDA cluster. This blog is to discuss the approach to find a way, fast, easy and independent of CDH cluster to verify the content of a keystore is valid or not. 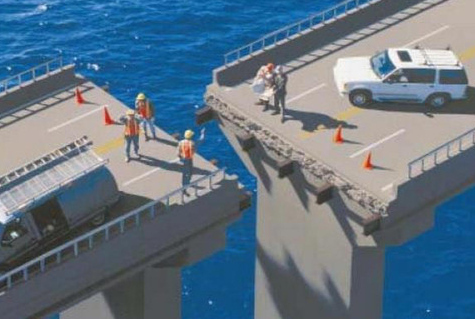 Most importantly avoid the bridge building mistake shown below. As my topic is related to BDA, I am going to list the ways to create a keystore in both Cloudera and Oracle ways. 2. Generate a CSR for the host. 3. Submit the .csr file created by the -certreq command to Certificate Authority to obtain a server certificate. 4. Copy the root CA certificate and any intermediate CA certificates to /opt/cloudera/security/CAcerts/. There is no /opt/cloudera/security/CAcerts/ directory exist on BDA and I don’t believe it is necessary. Actually I like Oracle approach, just copy the root and intermediate CA certificates to /opt/cloudera/security/jks directory. But I do like Cloudera’s approach to import root CA and intermediate CA certificates to the alternative system JDK truststore, jssecacerts, before importing them to the Java keystore on BDA. This is what Oracle’s approach is missing. 5. Import the root and intermediate certificates into keystore. This is the place I like Oracle’s approach. Cloudera does require to have keystore in all hosts, but document in a way in separate chapters: Cloudera Manager and Agent. Only when I am done with the configuration, I realized why not combine them together in one single step. This is where Oracle’s approach is much simpler and easy. 2. Create CSR for each node. 3. Submit the node specific CSR to CA and signed. So for TLS on BDA, the keystore file is /opt/cloudera/security/jks/node.jks. Another important file is Truststore at /opt/cloudera/security/jks/.truststore. The approach to build this file is quite similar as node.jks. 0010: 12 69 27 D5                                        .i(. It is usually works, but with certain limitations. Even the keystore has all the necessary certificates, if they are not in the right order, it might not be a valid one. As I suspect my keystore on BDA might not be a valid one, I tried to find other potential tools beyond keytool. Luckily, I found a blog Installing Trusted Certificates into a Java Keystore by Oracle’s Jim Connors. It’s a very nice blog about various tools for keystore. I am really interested in one of the tool he talked about: using weblogic.jar‘s ValidateCertChain program. I happened to build an OEM Cloud Control 13c R2 environment. Ok, let me give it a try. Looks much better. It correctly shows there are one root certificate, one intemediate CA certificate, and one host certificate. This keystore is one of my major issues in building keystore on BDA. There is another command, openssl s_client, to validate keystore, but only useful when everything is configured.